It was written of St. Moses prior to his discovery of the “real” God that everything he did was to physical excess, drinking, eating, adultery, and acts of violence. His ways were impure and unclean and possibly physically addictive because they would prove to haunt him through spiritual warfare when he greatly desired to set them aside. Just as compulsive as his physical desires, was his obsessive desire to know the “real” God. In this one area of St. Moses’ earthly life, it appears his judgment was not entirely lacking. He was in constant search of perhaps something fulfilling in his life. St. Moses never had a complete hardness of heart nor did he refuse to accept the mercy of God once known to him. St. Moses’ heart while entertaining malice and evil was not completely captured by it. Most probably his greatest asset was his strong heart rather than his strength to do violent acts. It has often been said that the heart is the center of all consciousness, the foundation of the intellect, and the place where the will of man is forged. It certainly is the place where the spiritual life must proceed from. It does not make sense that a man known for his evil acts would leave the place where they are so readily accepted and allowed to venture into an unknown area where his acts of evil are considered wicked and viperous as the snakes that travelled on the dunes of the sands. Why would St. Moses have so readily direct his journey of life to the Shehet desert? One can be sure it was no accidental pathway or his need to wander outside of his cultural parameters where his fierce reputation would not precede him. 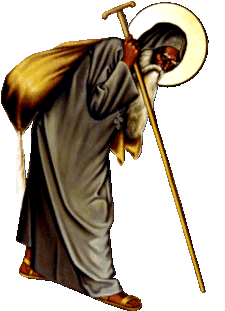 The first monk St. Moses would encounter in the desert of Wadi El-Natroun would be pious St. Isidore who would neither turn him away nor condemn him. St. Isidore led him to St. Macarius the Great. St. Moses was led to two of the finest fathers the desert had within its monastic walls — both full of divine goodness, both strong in faith that could teach, preach, and live life by example and love for the Lord. Each individually and both collectively could expel evil out of the heart of a man who never knew the Lord Jesus Christ and allow God’s mercy and grace to permeate it with each heartbeat. St. Moses learned of the Lord Jesus Christ, confessed, and was baptized at the hands of St. Macarius the Great. Goodness surely begets goodness. As God’s grace permeated the heart of St. Moses, it began to guide all his actions and thoughts and he desired to become a monk just as St. Isidore and St. Macarius the Great. While violence once filled the heart of St. Moses, God’s grace made it violently stronger. Stronger as time grew through the ages to overcome the addictive nature of the evilness that once inhabited it. Unless the heart is strong and the repentance is full, the Holy Spirit cannot permanently reside within it. For St. Moses we can be sure the Holy Spirit resided within his heart because malice and evil did not return and reoccupy its abode. God’s grace and mercy had made a strong heart stronger and more exceedingly violent. As St. Moses increased in his monastic life, a strong heart became a necessity and a way of day to day spiritual survival. Although St. Moses became a monk his past life did not evaporate in the heat of the desert’s sun. Quite the opposite occurred as his spiritual warfare initially intensified. St. Ephraim El- Surian said, “He who does not endure the trials is like a building which has no foundation.” St. Moses’ addictions and impulsivity were so inherently ingrained; he would find himself desirous of old habits of eating, drinking, and fornication. With insight into his behavioral desires and recognition of his poor past judgment, St. Moses would tell St. Isidore all his spiritual pitfalls. He was advised to keep his mind busy and his strong physical characteristics utilized to exertion. St. Moses would learn to rely solely upon his strong heart. While the elderly monks slept in the early hours of morning, St. Moses would put the solemn advice of St. Isidore to good use. St. Moses would go to the cells of the elderly monks and fill their water pots with water from a well many kilometers from the monastery. A task an elder feeble brother might have found difficult and unsafe from the wind blowing sand and sun of the desert life. Dissatisfied with his inability to deter St. Moses from the heavenly life of the monastery, the devil inflicted this already tortured saint with disabling physical illness leaving him bed ridden. Through an undeterred strong heart, St. Moses increased in prayers and asceticism. God not only healed St. Moses of his illness but St. Moses would increase in respect among the monks for his suffering and ability to sustain his beloved monastic life through it all. Nothing came easily for St. Moses. His decision to enter into monasticism was more than contemplative thought and discussion with his priest and family. He had neither Christian family nor priest. He had no prior Christian examples to follow in leadership, no prior Christian heritage to rely upon, and no Scriptural foundation to provide him with added courage. No family lineage would give homage of worth to his decision to enter monasticism. Withstanding the difficulties encountered hardily, St. Moses would progress and become a desert priest following years of spiritual refinement. But the Lord our God was not finished with the heart of a desert priest that had been transplanted with His mercy and grace. St. Moses would become a desert father of 500 monks. St. Moses’ strength of heart had overcome what some would say would be “impossible odds” and others may have considered that he was born into and came from “a brood of vipers” and conversion unfathomable. With the conversion and growth of St. Moses, he became one of the strongest defenders of the faith both spiritually and physically. In the fullness of time, the Berbers came and attacked the monastery of St. Moses. As its abbot, St. Moses quickly upon attack instructed the monks to escape if they wanted to. St. Moses chose to stay behind along with 7 brothers who were all killed by the sword. The relics of St. Moses the Strong are located within the Virgin St. Mary’s Coptic Orthodox Monastery of El-Baramous. St. Moses’ strength of heart led him into the desert and made it his lasting dwelling place. Truly it was his heavenly life on earth. St. Moses would etch out a place of historical honor within Coptic Christianity for strength of heart only His love of God could forge. Although St. Moses was killed by the sword, his strong heart will continue to have a heart beat throughout Coptic history this day and to the end of the ages, as his holy name is mentioned upon the altar and places of Coptic gatherings such as churches and retreat centers bear his holy name. May the strength of heart of St. Moses and all those saints before and after him beat within us and deliver us from all spiritual warfare.